WorkOne Indy is more than two brick and mortar locations on either side of town. It is made up of the combined efforts of staff, partnerships, referrals, employer partners, and more. As EmployIndy has sought to find more ways for career services to be available in strategic locations that most need support, partnership with Ivy Tech has proven to be successful in connecting job seekers to local employers. 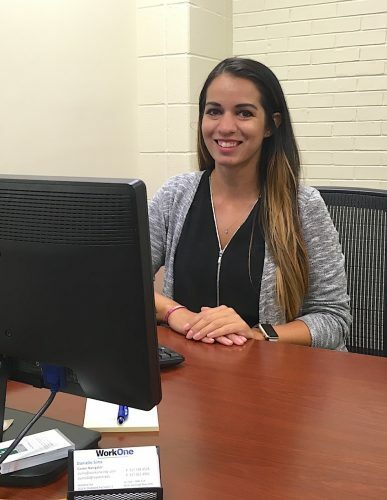 Though she says her most common type of support is helping people maneuver through the job search process, Sims also is quick to say that she never sees the same situation twice. Generally, though, there is a pretty even split between people who are seeking help with a career upon matriculation versus those needing a job “right now” while enrolled school. Her services often include resume and application help, sharing opportunities like hiring events and job fairs, and connecting clients to community resources. Ivy Tech students are not the only people who make use of this resource. With the main campus positioned squarely in the 46208 zip code, this access point also serves as a location that people in the nearby neighborhoods of this target impact area can utilize. With the school year about to start, WorkOne Indy is ramping up on-site hours to 20 per week to be well-positioned for the activity that comes with a new fall semester. Ivy Tech has done some outreach to ensure that students know WorkOne Indy is offering an on-site resource, and Pearson is quick to say that he believes WorkOne Indy’s presence has enhanced the ERCC’s growth in intake numbers, “becoming more a part of the vernacular for students, faculty, and staff.” Danielle Sims has personally taken that effort a step further. “Now that I have been co-located here for a while, I have had an opportunity to learn how things work at Ivy Tech and network with others on campus,” she says. One example of this is working with academic advisors to help connect students to Indiana Career Explorer to help students more clearly understand how their strengths and interests can lead to a meaningful career. During the school year, WorkOne Indy can be accessed on the fourth floor of theIvy Tech North Meridian Center in room 414 from 8:00am – 4:30pm on Tuesdays and Wednesdays, and from 10:00am – 2:00pm on Thursdays.